Hydropothecary Corporation (HEXO.TO) is a medical cannabis producer based in Gatineau, Quebec focusing on product innovation, advanced natural growing techniques, client health and safety, and exceptional customer service. The company is, of course, going to sell recreational cannabis for adult use on October 17, 2018, as the Bill C-45 passed earlier this year. Hydropothecary has an exceptional advantage particularly in Quebec: There are 9 licensed producers at the moment, however, Hydropothecary is only one of them who is authorized to sell. The others can so far only cultivate cannabis. This is putting the company in front with all necessary preparation for heavy demand of the recreational marijuana. Hydropothecary Corporation is finishing a 250,000 sq. ft. state-of-art greenhouse with a production capacity of 25,000 kg of dried cannabis. As there are doubts of supply in general Canada’s cannabis market, Hydropothecary’s production shows delightful capacity preparation. The company is going to focus its distribution firstly in Quebec. It has already finalized an agreement with SQDC to be the preferred supplier with 20,000 kg of products in the first year, 35,000 kg second and 45,000 kg the third year. Furthermore, Hydropothecary plans to supply 200,000 kg into Ontario, Alberta, and British Colombia within five years. Hydropothecary has announced a new brand for the recreational adult-use market – HEXO. It will also top quality cannabis as Hydropothecary brand is for the medical market. In March 2018, Hydropothecary announced an agreement with Shopify, one of the world’s most respected online commerce companies, to build its e-commerce platform for cannabis products. The bilingual website will improve the shopping experience for medical cannabis patients by streamlining the medical registration and ordering process, and provide information for discerning recreational consumers. It will also support engagement with provincial and territorial cannabis retailers while giving the flexibility to adapt to regulatory challenges and market variations from province to province. This platform is an important component of the Canadian distribution strategy. culture propagation into the cannabis plant production process. The company’s financial model has been developing in a very right trend so far. Management has been able to gradually increase revenue and decrease cost per gram. These are important elements for future growth. Hydropothecary Corp. is dealing very well with financial risk management. All Interest, Credit and Liquidity risk was approximately $250,000. The obligation to be paid within the next year is approximately $6,000. After the legalization of recreational marijuana the overall industry has risen up obviously and now the pot stocks are experiencing consolidation. Some are consolidating better than others and some worse. Some are volatile on the fancy news and some are stable. Hydropothecary stock is experiencing stable consolidation while outperforming both overall industry and top marijuana ETF – HORIZONS MARIJUANA LIFE SCIENCES INDEX. First, it completed a catalog Cup and Handle Pattern – no more to say. Second, it went through quite a volatile consolidation due to a mix of worse and better than expected earnings. It was mainly due to investment in the greenhouse mentioned earlier and stock issuance to raise capital. These are healthy practices of every bigger cannabis company. Consolidation was ended by a break of orange resistance line. Third and last, after the price rise, the Hydropothecary stock entered current consolidation in form of a yellow Rectangle Pattern that is waiting for its completion. Due to the short life of the stock, the price hasn’t been finding support at longer moving averages yet. Only the 20 EMA served as a bouncing platform when Hydropothecary was heading upwards. Thus, it’s perhaps hard to determine support level. An important fact is that pot stocks are in consolidation and hence, it can break both down or up from the rectangle in short-term. Timing a trade is not an easy task. One may argue that it is nonsense. However, with a young stock in such speculative industry as this one, the price can easily drop 10-20% and thus if you’re a short-term trader, you are going to take advantage of this. On the other hand, if you’re a long-term investor, you might not need to care and take a LONG position now, because it is assumed that this stock is going to increase at least 300% in upcoming 3 years. There were cannabis stocks that increased 2000% in the recent three years – this industry has enormous potential. One way or another, technical indicators can help with decisions. RSI and MACD are showing a slight divergence. During the current rectangle consolidation, the price moves sideways, however, the RSI and MACD move downwards. This is a proof that fewer and fewer market participants are selling. The trader with higher risk appetite might take the position once these technical indicators slope sharply UP. 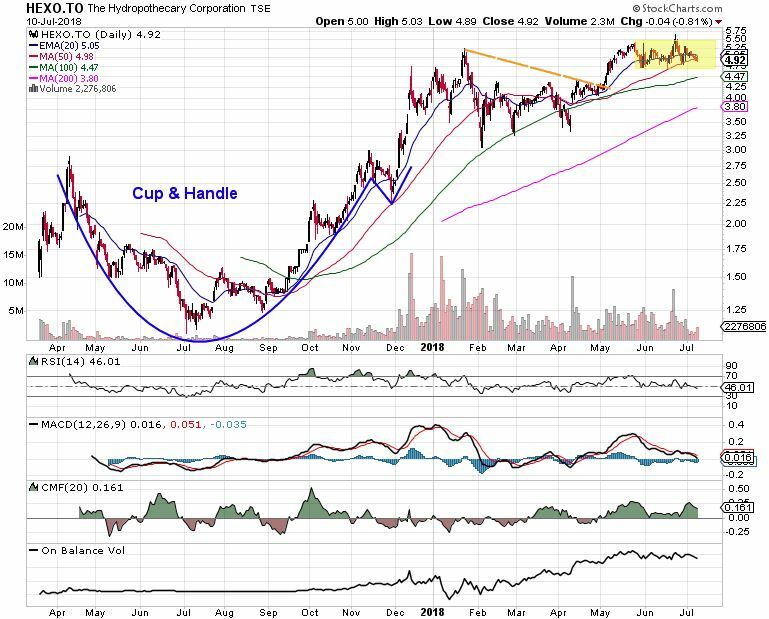 The other two indicators show a strong long-term uptrend of the Hydropothecary stock. Chaikin Money Flow (CMF) depicts a buying power and On Balance Volume depicts no divergence, it goes with the price and hence, no surprises are expected. A wise trader is not going to take a position at the moment in Hydropothecary stock. When the price breaks up from the yellow rectangle, that will be the right time to take the LONG position in this good quality cannabis producer. Investing in Hydropothecary Corporation or HEXO may bring fruitful profits for the investors in both short-term and long-term. Stay disciplined and focus on the big picture! If you like this article, please share using the below buttons or by any other form as you like!